Seized inside a U-Haul storage facility. Boston Police report arresting three Roxbury men after the trio had spent the evening allegedly stunting their way through traffic in the Newmarket Square area. Read more. State Police have released the names of the seven men arrested in the showdown between stunters and state troopers on I-93. Read more. I-93 after the cops moved in. Photo by Annabelle Blake. A large group of masked riders on dirt and quad bikes who spent the day stunting, blocking traffic and scaring pedestrians on streets around Boston had their trek ended by State Police on the Southeast Expressway at Mass. Ave, where troopers and other officers blocked them in - and shot one in the foot as he tried to flee arrest around 5 p.m. Read more. Paul Nutting videoed the riders who normally cause problems on Boston's narrower streets and avenues going out for a spin on Morrissey before getting on I-93 in Dorchester. Jesskowski reports about ten riders stunting as they got on the highway around 6:30 p.m.
Boston Police report seizing 16 off-road vehicles at BHA projects in raids this morning. Read more. 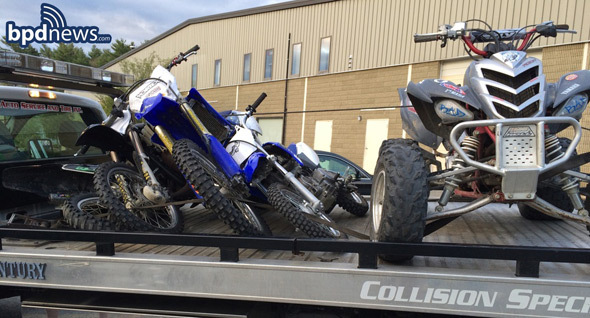 Boston Police report they started their annual crackdown on dirt bikers and ATV riders on March 30, seizing three off-road vehicles. Read more. Boston Police report teaming up with Walpole and state environmental police and other agencies on arrests of Boston Bike Life people they charge were tearing up the roads from Boston to Walpole with dirt bikes and ATVs. Read more. Boston Police report arresting two men after officers watched them "riding two dirt bikes at a high rate of speed, nearly hitting several pedestrians and other vehicles while weaving through lanes of traffic in the area of Seaver Street and Blue Hill Avenue" around 3:40 p.m. yesterday. Read more. Boston Police report arresting five Cape men Sunday on a variety of charges, including operating motor vehicles without a license, after they allegedly ripped up the streets of Mattapan on dirt bikes - and as they were loading the bikes into a rental truck. Read more. Ready to roll - to the BPD evidence warehouse. Photo by BPD. Boston Police report officers sniffed out a cache of street-unready dirt bikes - and an ATV - in Dorchester yesterday morning. Read more. Boston Police report seizing several scooters and dirt bikes at 52 Stonehurst St. in Dorchester this morning. Read more. 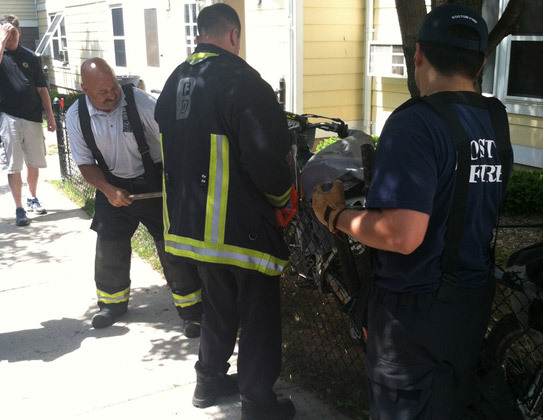 Dirt-bike chains prove no match for a firefighter with a bolt cutter. Photo by BPD. Boston Police report some residents fed up with dealing with dirt bikes let officers know where they could find seven dirt bikes all ready for collection at the Mission Main project yesterday. Read more. These dirt biker gangs need to be off the streets. One was on I-93S just north of exit 18 and was blocking multiple lanes of traffic as well as impeding lane changes. They were driving slowly and performing dirt bike stunts. One of these idiots hit my car with something and left scuff marks and dents in it. It's about time we get a task force together to get rid of them. This doesn't happen anywhere else in this state that I've seen.